Today chewed me up and spit me back out. I won’t go into it, but I’ve decided to take the afternoon for myself. I’m looking at Pinterest and reading blogs. I haven’t done either of those things in a while. I miss it! Today was my first day teaching art. While the rest of my day was rough, I enjoyed my classes. (For those who may be new to my blog, I am in a STEAM lab this year. I teach 6 classes a day K-5 on a three day rotating schedule.) I was a little nervous about it. My first two classes were a little crazy, but by the end of the day I managed to finish projects AND clean up before they left me. With only two minutes between classes it is a bit hectic! I’ve already had several students complain that they are not good at art, so I thought it would be a good starting ground. I gave each student frames to fill with their dot creation. They got 4-8 frames depending on the grade level. I had stations set up around the room for them to create using crayons, markers, paper/glue, and watercolor. 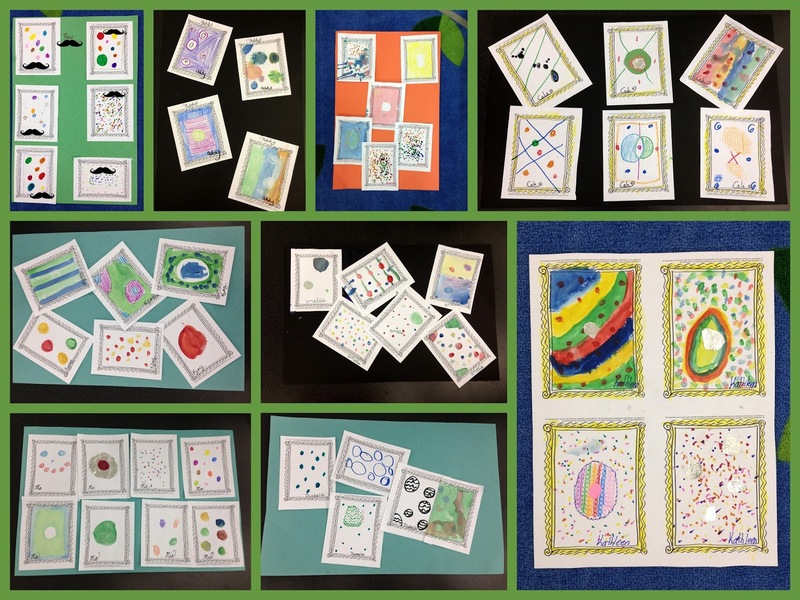 After they completed their dot art, they put it together into their own dot gallery. They look fantastic! It wasn’t the most technical of lessons, but they were really creative and even the fifth grade boys who rolled their eyes when I started the lesson got into it in the end. My next step is to sign up for International Dot Day. It just so happens to be on my birthday. I want to get each student to design one more dot that we will hang up on the GIANT bulletin boards outside my room. With 18 classes K-5, it will be a lot of dots. Earlier this week I did some more with the Common Core Digital Citizenship Curriculum. I printed these in poster size. I found with the number of our students on Instagram, I was using the middle school poster starting in third grade. Crazy! It is a great resource though! My own two little ones have requested a picnic in the living room the last two nights. No picnic is complete without popcorn and a movie. After a long day at work, I can’t complain! I knew Monday was Labor Day, but it wasn’t until yesterday that I realized we are off on Thursday as well. Many of the schools in South Florida don’t have school on the major Jewish holidays. I am not Jewish myself, so I didn’t realize it was next week. Talk about a welcome surprise! I won’t turn down a three day week! Your dot projects are adorable! I love that you set up stations and let them move around the room - so fun! Can I come to class?! You projects look fantastic (and your kiddos are adorable!) Hope you have a wonderful relaxing weekend after a hard week! What a great surprise to have a 3 day week! The art teacher at my school just borrowed my copy of The Dot. I think I will forward this blog post to her as well. Maybe she didn't know there was a video.